Charleston Culinary Tours is planning a Fresh at the Farm Dinner Series featuring Executive Chef Stephen Thompson of Prohibition, a new contemporary American gastro pub downtown. Setting the scene for a true farm to table experience, each dinner event will take place at a local farm. The gastronomic evening with start with a cocktail hour and hors d’ oeuvres from 5:30-6:30pm and then family style dinner will be served from 6:30-8:30pm. The first dinner will be held on May 4th at Walters Farm in Saint George with additional dinners in the series in August and November. With a table set for 40 guests, the cost is $75/person with tickets available at www.charlestonculinarytours.com. Walters Farm is a fitting start to the Fresh at the Farm Dinner series as Chef Thompson and Stephen Walters, proprietor of Walters Farm, have been friends since childhood. Chef Thompson jokingly refers to Steven as “his personal farmer”. 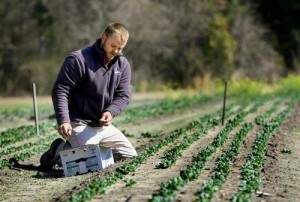 Steven Walters personally grows and harvests everything on his 5-acre farm and then makes the 45-minute drive to deliver it to Chef Thompson. Both are excited about allowing guests to dine on ingredients right where they are produced, fortifying the connection between farm and food. For additional information about Charleston Culinary Tours, please visit www.charlestonculinarytours.com.